Pump grease into the nut until the pressure pad is sticking out 1/8" equally around nut. 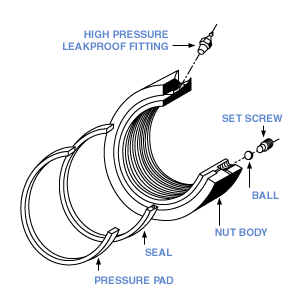 Put nut under an equal amount of pressure and watch for leaks. IF: grease leaks out around seal area, the seal has either been cut or there is a nick in the groove area. IF: Grease comes out from the bleed area, tighten bleed screw (do not over tighten. If grease continues to leak, the bleed hole must be drilled with a 29/64" flat bottom drill so that the ball can seat properly. Drill about 1/16" deep, staying clear of the groove area. If 1/16" is not enough to get the indentation out, go just enough to remove indent. If the groove area is hit, the nut will be beyond repair. IF: Grease leaks around threads of fitting, nut has to be counterbored deeper to tighten fit around threads. Note: When replacing grease fitting, use teflon tape around threads of fitting. CAUTION: JERRY TOOLS PART #1800 HIGH PRESSURE LEAK-PROOF FITTING MUST BE USED FOR JETNUT TO WORK PROPERLY. IF ONE IS NOT USED, IT COULD CAUSE A FAILURE IN OPERATIONS. CONSULT FACTORY FOR REPLACEMENT FITTINGS. Repair kits may be purchased from Jerry Tools by using the Model # of the Jetnut. Example JNS7000 - Repair Kit No. 1 or 2. No. 2 kit has pressure pad included.